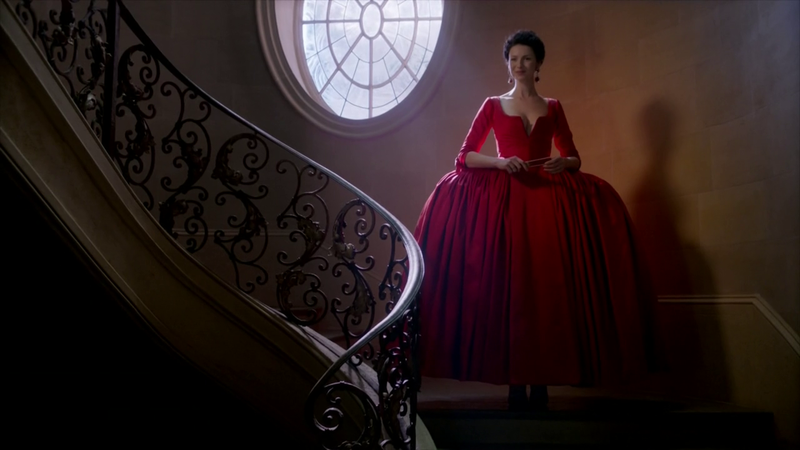 After an emotionally intense season opener, Outlander lightens things up considerably as Claire and Jamie induct themselves into the Parisian culture. This is a new setting for the show so spending some time allowing Claire and Jamie -as well as the viewer- some time to take it in and acclimate to their new surroundings is a good move. Lots of time is spent showing how life here is very different to what we saw in Scotland last season. The first major difference is that Claire and Jamie are living an upper class lifestyle which is pretty much the polar opposite of how they lived last season. Everything from the clothes and decor is more ornate and the problems that people deal with seem trivial in comparison to the harsher conditions back in Scotland. I like the new setting as it changes things up in the show significantly. It looks a lot different to the first season in a good way and the focus remains on the characters and their relationship to the world as well as one another. Claire is shown to have difficulty getting used to having servants do everything for her as shown by an amusing scene where the maid feels a bit left out because she has no opportunity to do anything for Claire. This tells Claire that she has to think differently to fit into this setting and makes a note to be “sloppier” in her “personal habits” so that the servants can have a sense of purpose. It’s a good indicator that Claire still has to get used to this new way of life and it sets the tone for the episode being a lot lighter than last week. With a new setting comes new characters such as the memorable Louise de Rohan (Claire Sermonne). Claire’s narration calls her warm and caring but a little superficial and that’s exactly what comes across in the scene introducing her. She is shown to be carefree and uninhibited while making no apology for it. In some ways she reminds me of Geillis in the first season which is good because the show has been lacking that kind of presence since her exit. This introduction scene as she put up with the pain of being waxed as it counts as a necessary evil for her as well as a transformative experience in many ways. She observes that the wax being warm and comforting when applied and painful when removed is simply a part of life which indicates a subtle depth to her that makes me think she has endured some kind of hardship and come off stronger for it. Claire’s reaction to Louise’s lack of modesty is hilarious and the way she takes the advice by trying it for herself further shows her becoming used to her new surroundings. The majority of this episode takes place at a party for the rich at Versailles. Claire and Jamie attend in the hopes of gaining the support of the Minister of Finance Joseph Duverney (Marc Duret) so that the Jacobites don’t get the money they need to help them rise up. Their plan has a few steps to it such as Claire making sure she’s part of the inner circle of influential women who basically stand around being bitchy. Claire is clearly the leader of this group and her outward confidence proves her more than up to the task. It’s interesting to see both the official and unofficial social hierarchy start to be drawn here. My feeling is that the unofficial one will prove important. 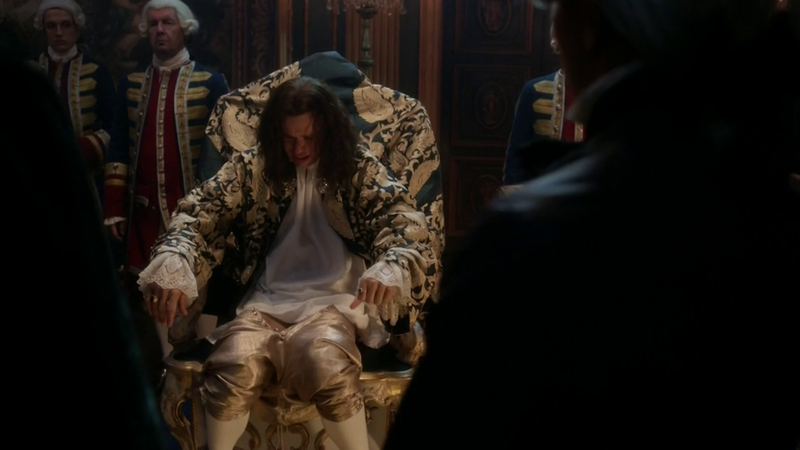 Jamie tries to get an audience with King Louis XV (Lionel Lingelser) who is having trouble evacuating his bowels. It’s a really surreal yet hilarious scene made even better by Murtagh’s line “Only in France does a King need an audience to shite!”. It calls out the ridiculousness of the situation and further reinforces the differences between Scotland and France. Murtagh is clearly out of his element and is having trouble adjusting which makes for some amusing moments from him. It doesn’t take long for Jamie to make an impression on the King after he suggests porridge to be a good antidote for his particular issue. This causes him to see Jamie as a bit of a peasant as noblemen don’t eat porridge. He looks down his nose at Jamie for the suggestion but comes around to the idea quickly. As funny as the appearance of the King was I found his character to be a little ridiculously cartoonish. Maybe it’s supposed to be a riff on a French farce but it does feel slightly out of place though it was a clever way for Jamie to find some way of impressing him. Their plan starts to look successful when Claire makes a distinct impression on Joseph Duverney in her captivating red dress though his lecherous ways make the situation a little too awkward. Once Jamie defends Claire’s honour Joseph is embarrassed by the situation and offers his friendship as well as challenging Jamie to a game of chance sometime in the future. This should provide opportunities for Jamie and Claire to have some influence on how he thinks. On the surface the party appears to be glitzy and glamourous but Claire’s narration reminds us that Parisian society won’t stay this way for much longer since the revolution is on its way. The whole idea of inevitability will probably be a running theme throughout this season considering we already know that Claire and Jamie’s attempt to stop the Jacobite uprising fails. 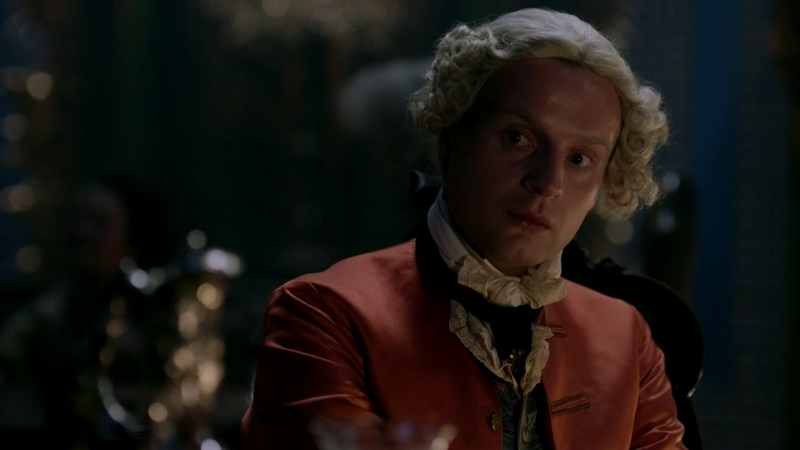 This episode introduces Bonnie Prince Charlie (Andrew Gower) who first appears in a brothel showing that he has a playful side and that he isn’t shy about where he gets his entertainment from. He also appears to be driven as he immediately expresses his desire to have the clans rise up behind him. Jamie’s attempts to dissuade him from attempting the uprising are interpreted as cowardice and a defeatist attitude. Charlie essentially writes off everything Jamie says as he believes it is his right to restore the throne the way he feels it should be. Murtagh’s words about the cause not being enough to make people rise up create doubts in Charlie’s head but he is still committed to moving forward to it. He firmly believes that he represents God’s will and it seems that nothing will dissuade him from that. Jamie is appointed as Charlie’s right hand man to get the support of the Minister of Finance which starts the plan to make sure that he doesn’t help. It’s already a complex situation that will clearly spiral out of control fairly quickly. The major character developments from last season haven’t been forgotten about. Jamie is still haunted by Black Jack Randall’s violation of him in the form of vivid nightmares that constantly interrupt his sleep. This drives a wedge between him and Claire as Jamie is unable to be intimate with her no matter how hard he tries. Sam Heughan plays this really well and his damaged hand represents his emotional turmoil. It’s clear that he has a long way to go before he is able to function again without the constant reminders of what was done to him. Generally speaking Jamie is having trouble adapting to his new surroundings. 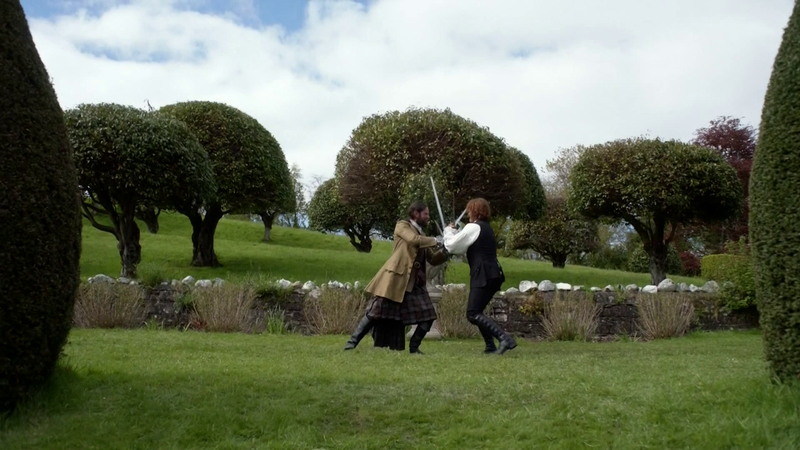 The best example of this was the dueling practice he engages in with Murtagh. With so much that is different around him all the time this marks something he understands and fondly reminds him of home. Murtagh feels similarly about France but is committed to helping Jamie and Claire succeed in their plan. He even suggests assassinating Bonnie Prince Charlie as that would probably solve the problem. It’s an idea that deserves to be discussed because forward knowledge allows for that possibility but it is quickly shot down as not being Jamie’s style. Perhaps as the uprising becomes more inevitable the idea will be floated again somewhere down the line. The spectre of Black Jack Randall hanging over Jamie and Claire is made worse when the Duke of Sandringham is seen at the party and Claire finds out that Black Jack Randall is still alive and that her being seen in Paris will be fed back to him. It hits her like a punch to the gut as she is torn on whether to tell Jamie that Randall is alive. She has a fair idea of what that knowledge will do to him but also wants to be honest. It’s a tough decision she has to make and having it play alongside the fireworks to turn the celebration into an omen is particularly effective. Another problem exists with the news of their involvement in the destruction of the Comte St. Germain’s boat being spread as well as the knowledge that he has it in for them. There are certainly plenty of obstacles to overcome. Another excellent episode that lightens the tone from the emotional intensity of last week. Much of the episode is spent establishing the new setting and the major players within that. There are already some significant obstacles in Claire and Jamie’s way as well as an overriding sense of disturbing inevitability about everything they’re trying to do.